I wanted to squeeze in one more long ride before the end of the year so, in the spirit of leaving things to the last minute, I queued up this little spin for the morning of New Year's Eve 2015. 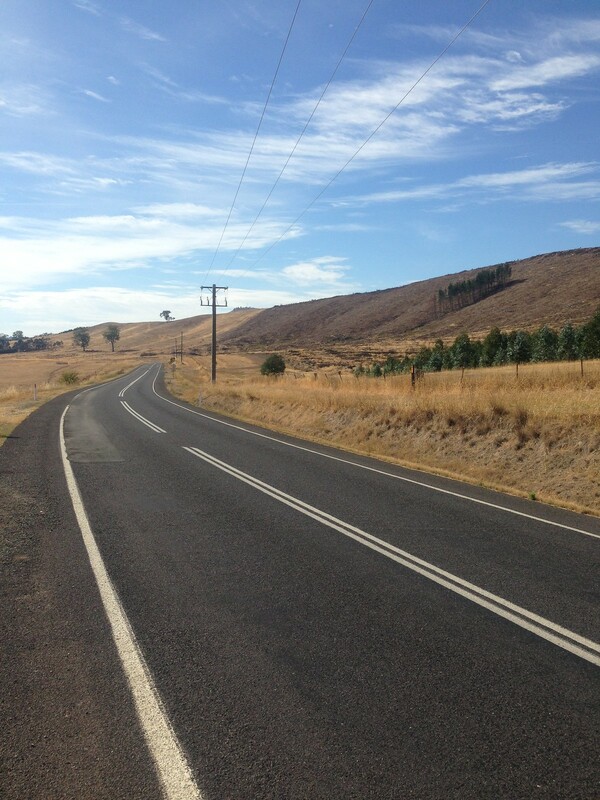 I'd been banging on about doing a flat road ride for a while so I figured this was my chance - a simple loop up to Seymour and back on country roads. There wasn't much dirt on this one but it was a nice solid ride through some nice country. I started early for this one. We were hosting a New Year's Eve barbecue at our place that night and it was forecast to be high 30s so I thought I should get the ride done before the heat of the day and be back in time to help with the barbie. I did the maths beforehand and decided that a 2am start would be the way to go. 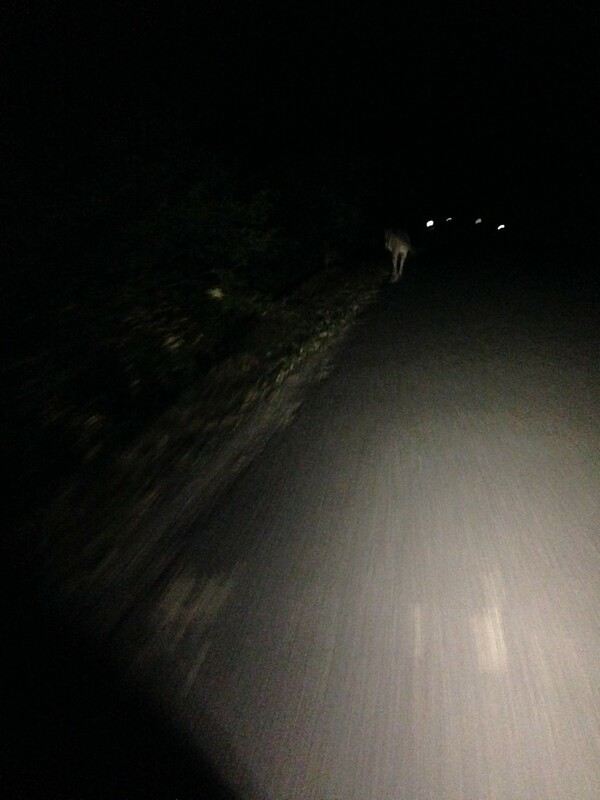 Rolling out of Hurstbridge it was a warm night and the riding was easy but, man, the number of animals I saw in that first section was ridiculous! 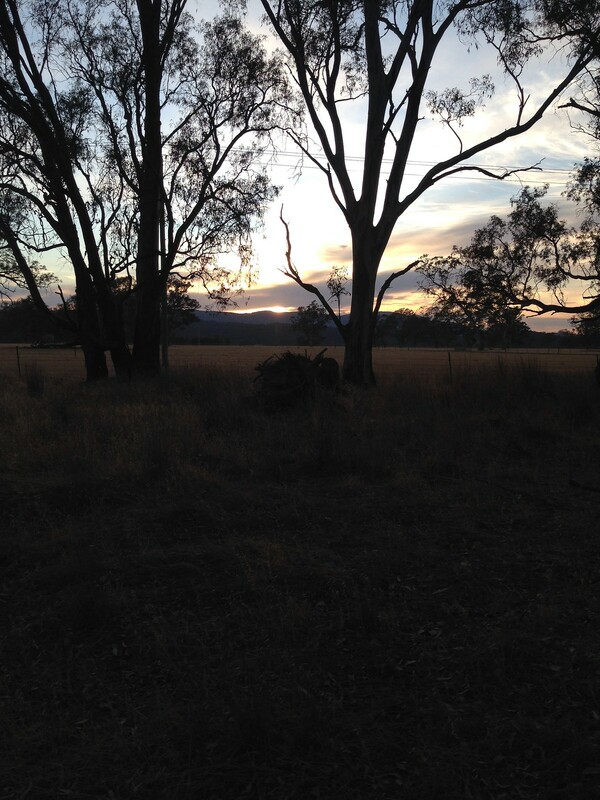 Between Hurstbridge and Yan Yean Reservoir I counted at least 13 wombats and countless roos. 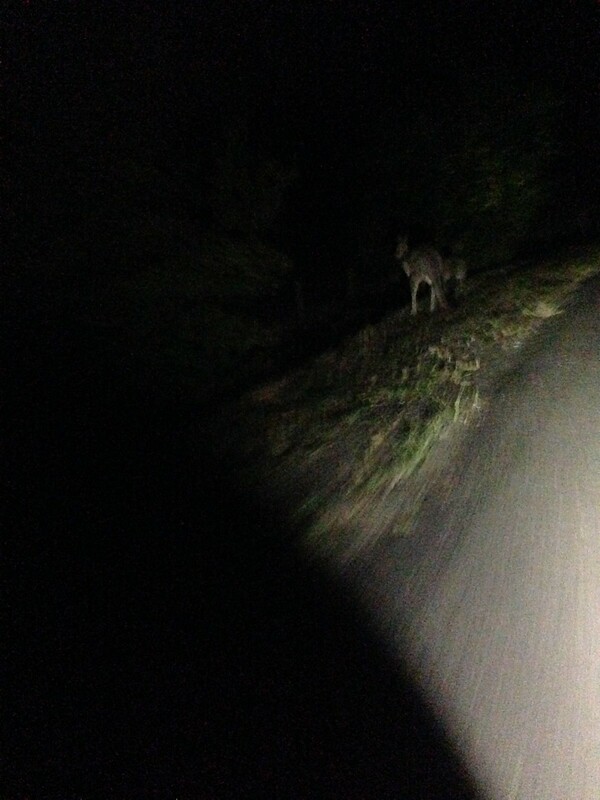 That's, like, 13 wombats in the first 13km of the ride. All over the road, they were. It was awesome! Plenty of times the wombats would take their sweet time moving off the road or the roos would spook and take off down the road in front of me for ages before finally hopping sideways out of my way. 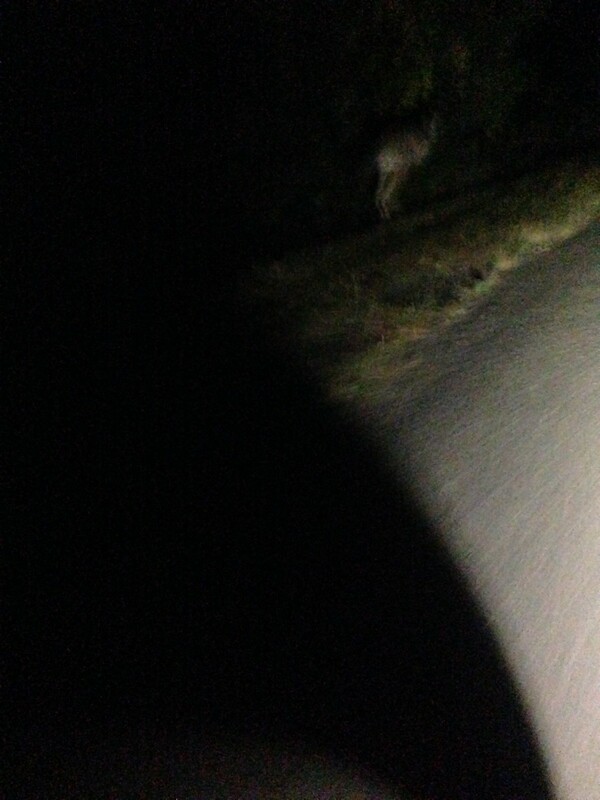 Driving a car through there at that time of night would be sketchy at best. Once the wildlife situation died down I settled into a good rhythm and began to tap it out. 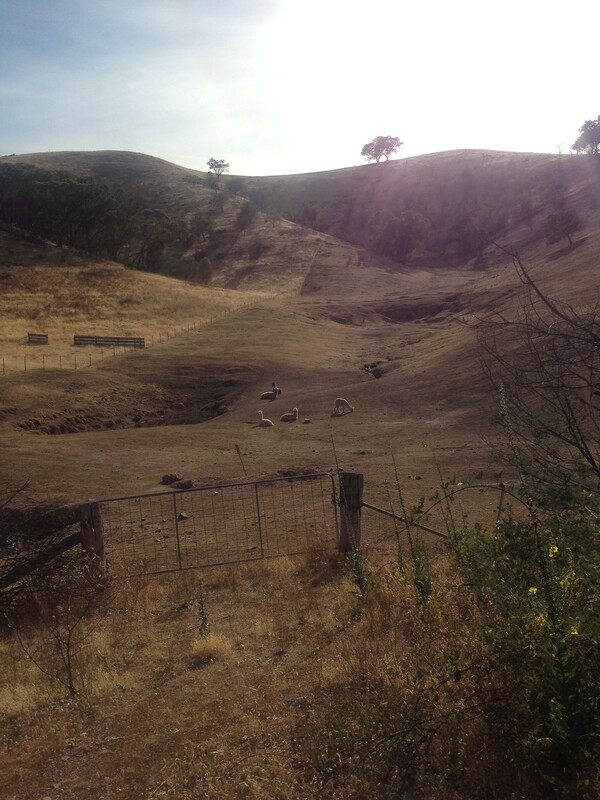 Past Yan Yean Reservoir, through Whittlesea, Wandong, Kilmore East, all pretty nice, if unremarkable, paved road riding. Just north of Kilmore I got onto the only major gravel section of the ride, a 25km stretch that shot me nearly all the way to Seymour. It was flat and fast, in the drops, big ring, making good time. The sun rose over Mt Hickey. It must have been 8am-ish when I hit Seymour and I was lazy so I stopped in at McDonalds for breakfast. I don't know why I do that. It's never a good idea and I bloody hate the breakfast menu. Oh well, that's what happened. I filled up water, slopped on some sunscreen and rolled on. A fast stop is a good stop. 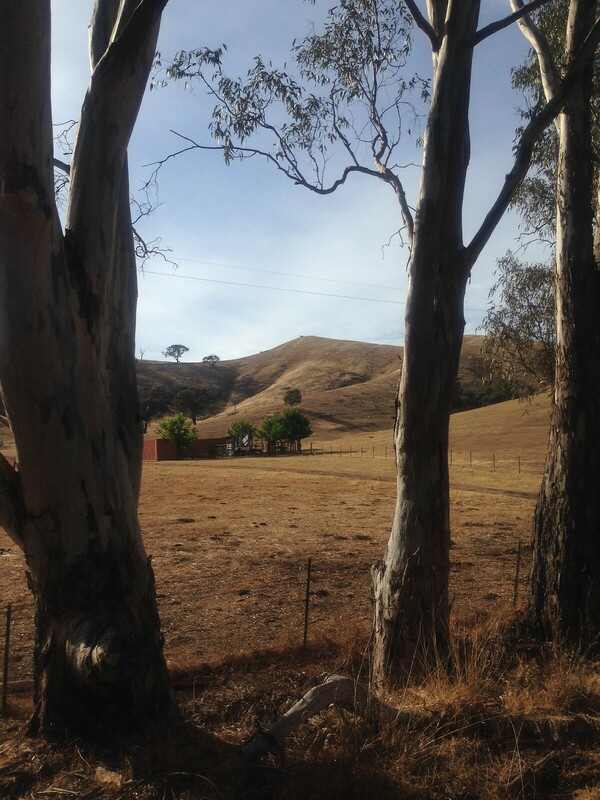 Easy rolling out of Seymour and it was most salubrious riding on the main road up above the Goulburn River. I'd never ridden this section before and I was pleasantly surprised. Don't think I was expecting it to be so scenic. Another thing I wasn't expecting was the massive hotel at Trawool. What the hell?! This massive hotel/conference centre place in the middle of nowhere. Who even stays there? Bizarre. ...and that black dot on that hill in the distance is a cow and and a calf. 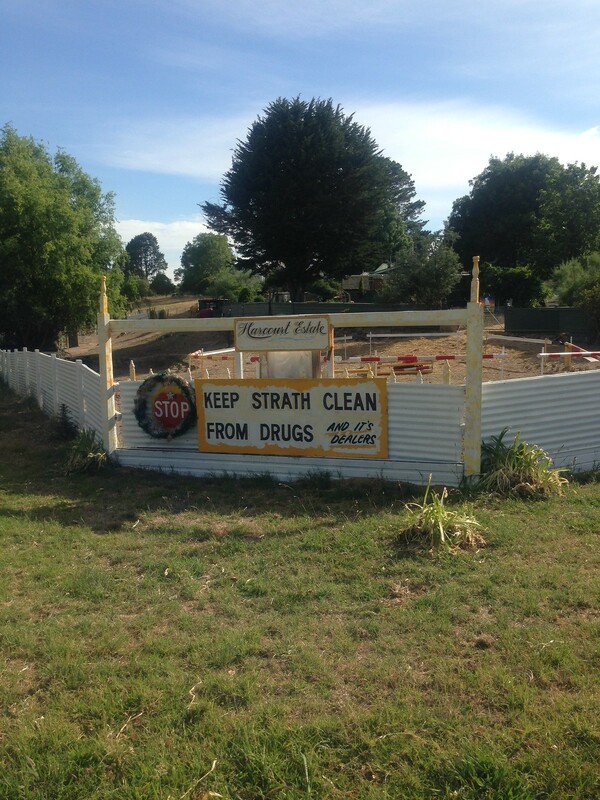 Strath Creek was still cute and small though I don't remember seeing all those hand painted signs last time I was there. Must be a new signwriter in town. Filled up water here and rolled on. It was getting hot. I started early to "beat the heat" but the heat was starting to beat me! Main roads all the way to Hazeldene but they're beaut riding. Had a relax at Hazeldene shop and fuelled up for the last leg. 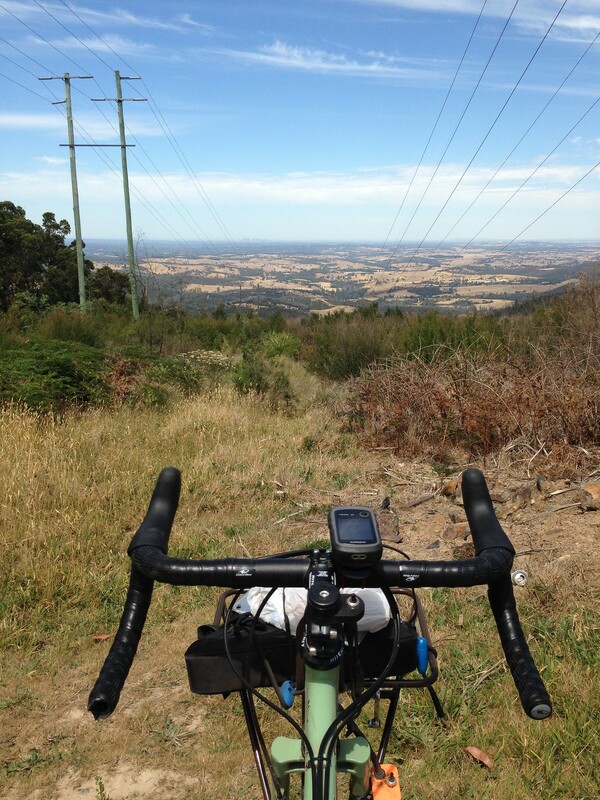 Up to Kinglake West and then, a welcome sight, the view from the top of Bowden Spur. 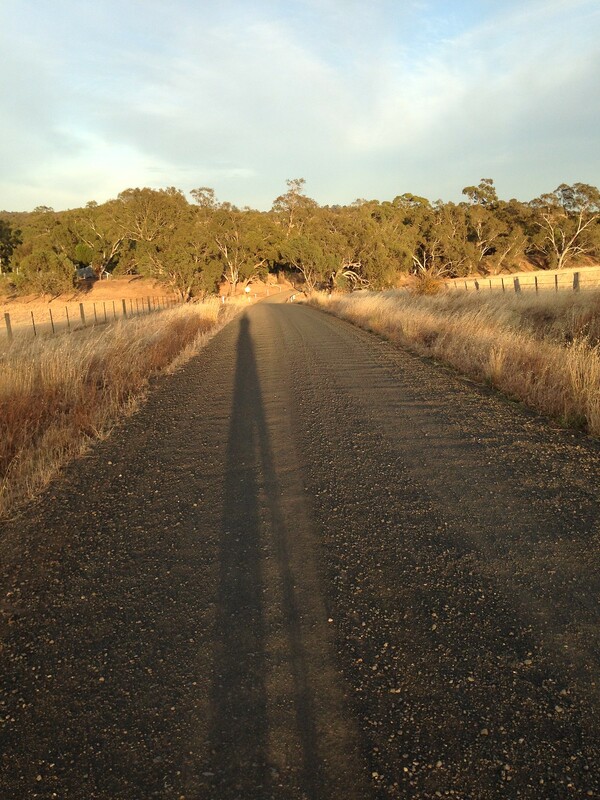 This was the second gravel section - Bowden Spur Road. 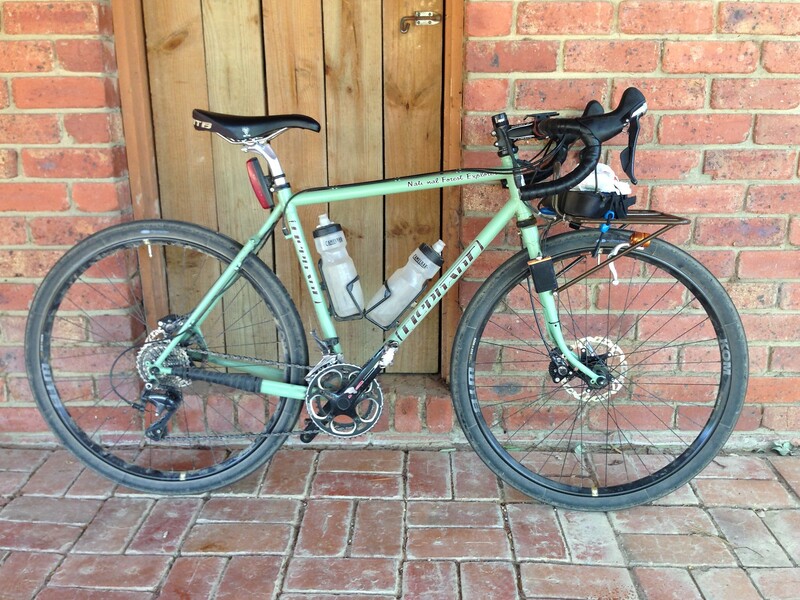 My favourite way to get back down to Hurstbridge. Fun descent with disc brakes and 42mm tires. 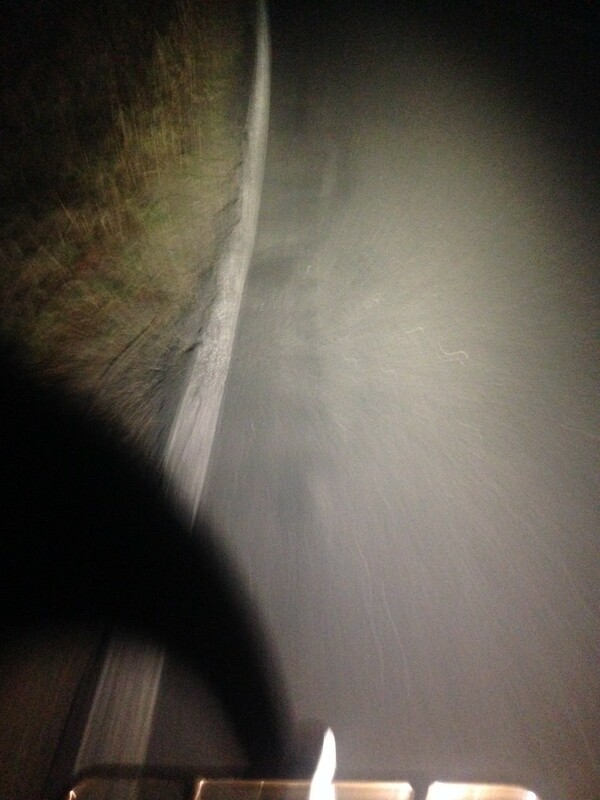 It's not very long though - soon I was back on the blacktop for the familiar last 18km into Hurstbridge. Home about 12:45pm, from memory. Snooze, cleaning, guests arrive, kids playing under the sprinkler and shooting party poppers at each other, barbecue food, talking, beer, yeah it was a good day.